Bold, current and sophisticated, AZZA introduces the newly revamped Spartan 102E. 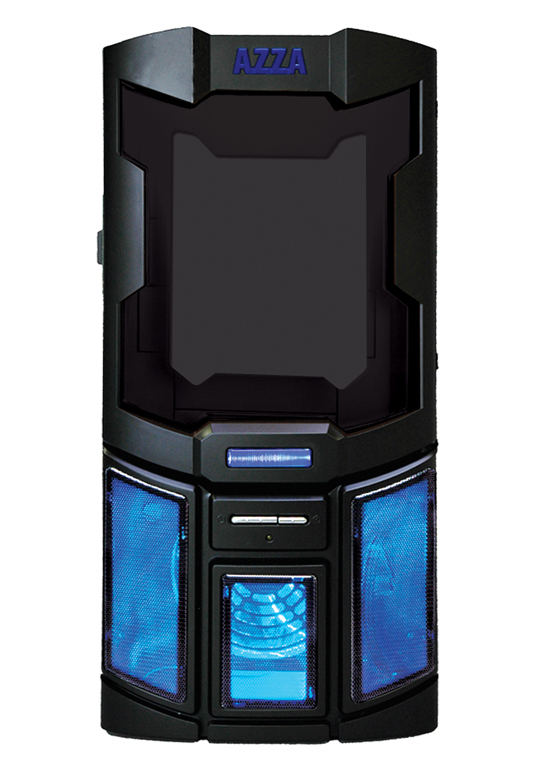 This mid-tower chassis has an enormous storage capacity with four external 5.25" drive bays, two external 3.5" bay, four internal 3.5" drive bays, 3+2 x 2.5"SSD, HDD Drive Bays and seven expansion. The screwless design for the drive bays allows for speedy installation. The side panel also sports a screwless design for effortless assembly and maintenance. Furthermore, the USB and Audio ports are conveniently located on the top of the case, designed for easy access. All your components will stay cool with one 120 mm front blue LED fan, one 120 mm side blue LED fan, and one black 120mm in the rear. Enhanced ventilation can be achieved by your option to add 2 x 120mm fans on top. Enhanced ventilation can be achieved by an option to add 2 x 120mm fans on top. Spartan supports water cooling radiator up to the size of 240mm, and the longest VGA card in the market up to 340mm (ATI 5970). It can accommodate Micro ATX and ATX motherboards and is compatible with all kinds of Nvidia. In addition, the black (exterior) on black (interior) indicates attention being paid to its detail. An adjustable PSU support bridge is located in the bottom and you may installing the PSU with the fan facing either up or down, for air intake or exhaust. The pre-drilled fan holes right underneath all but help to eliminate the PSU as one of the heat sources in the case! Furthermore, since cable can be organized behind the pre-drilled motherboard tray, this case comes with a superior cable management system that allows for improved cable routing and enhanced airflow. Combining style, performance and workmanship, upgrade your expectation without upgrading your budget with the AZZA Spartan 102E! 2x120mm fan on top(option) to exhaust hot air.